I'm always captivated by the elegant, unaffected diction of Alan Weltzien's poetry. Wherever his perspective may find itself, the imagery is fresh, the attitude is open and the language is uncluttered. From the mountains of western Montana to the beaches of Mexico to the cafés of France to the streets and temples of Japan, Weltzien casually invites us to share in his compassionate take on experience. Whether broad and sweeping, up close and personal or gently sardonic, the focus is always sharp and the voice is unassuming. a memoir, and several books of poems. older gentleman into waiting taxi. then back away from the curb. I stare, imagine such reverence. No polite head nods, these. their bows honor themselves, too. Would I ever bend so far for anyone? O. Alan Weltzien, a self-described "born-again poet," is a longtime English professor at the University of Montana Western, in Dillon, MT. He has edited, co-edited, or authored half a dozen books including a memoir, A Father and an Island: Reflections on Loss (Lewis-Clark Press, 2008), and his first book of poetry, To Kilimanjaro and Back (Stephen Austin University Press, 2011). 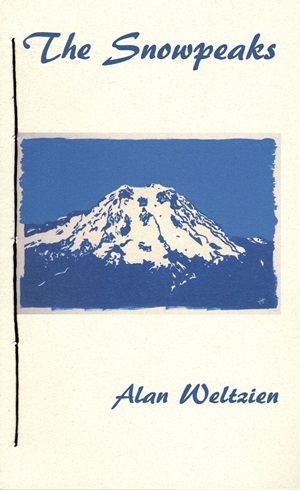 Weltzien has taught a range of classes in American, western American, and Pacific Northwest and Montana literatures, in addition to nonfiction workshops and nature writing. He is the recipient of two Fulbright Fellowships (Poland; Bulgaria) and one University of Montana International Faculty Award (Australia). Weltzien reads all the time and still likes to ski in winter and scramble mountains in summer.